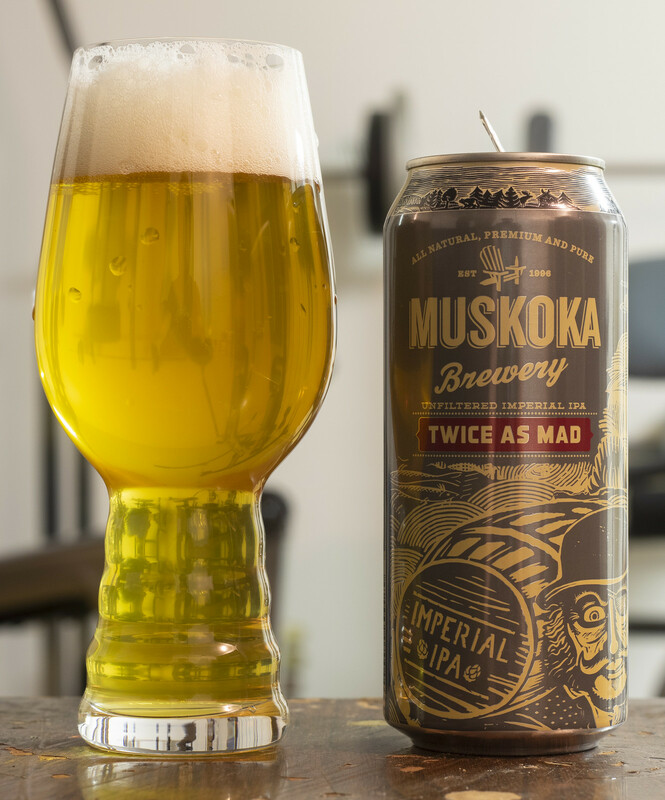 Six years ago this week I reviewed Muskoka Brewing's Twice as Mad Tom Imperial IPA (DIPA). At the time, Twice as Mad Tom was one of my go-to IPAs, though I found it a bit light on the palate for being an Imperial/Double IPA. The last time this beer was available in Manitoba was in 2015, so seeing this at the LC got me excited and made me felt like I should re-review this beer. I would have reviewed this days ago but my go-to LC sells out on limited release products the second it gets in so it took me a good week to go to another LC.. as the weather was harsh as heck. Appearance: The beer is essentially a lightly cloudy golden straw IPA, it has some translucency to it but it has just a tough of cloudiness. Good amount of carbonation in the body that's reminiscent of some of my favourite ales and pilsners from over the years. The head is frothy snow white and diminishes pretty gradually, leaving only a light amount of lacing on the side of the glass. Aroma: Pretty much malt forward - notes of caramel, a bit of nuttiness to it, some grassy hop profile and a moderate amount of bitter pine kick to it that I can already taste even before taking the first sip. Very light so far. Taste: The bitterness tickles the tongue near immediately, but the flavour of the malt is the first thing I actually taste. It has a sweet caramel presence to it, followed by a spiciness from the hop that gives off a bit of heat on the tongue. There's a good amount of pine bitterness, which I love, so it does have that old school IPA presence that I know and love. There's also a good amount of grassy hop presence as well as a bit of a lemon citrus presence in it. Overall Thoughts: Comparing this to the Twice as Mad Tom from back in 2013, this one is definitely quite a bit more aggressive with the hops, it has an aftertaste of pine that just won't leave my palate, compared to more of a laid back IPA with a caramel malt presence with a touch of hops here and there. I've had a can of this earlier today and I was thinking "this beer was probably better in 2013" but the experience changed completely when in a glass - so folks: always enjoy your beer in a glass, you're not going to get the full experience of the beer in a can.. in fact, all I noticed in the can was that it was a bit boozey and caramel-forward in the can.. while in the glass.. you already read what I said about this beer. One thing I wish Muskoka and MANY other breweries would do is date the can when it was produced rather giving it a best before date, or how about doing both? I have no idea if this was brewed six weeks ago or six months ago. This one has a best before date of April 30th, 2019.